Alec Baldwin sets record hosting "SNL"
(CBS/AP) Alec Baldwin became the most frequent host of "Saturday Night Live" when the show kicked off its 37th season on Saturday night, hosting the show for the 16th time. The actor opened the show by playing Texas governor and Republican presidential candidate Rick Perry in "Either the 7th or 8th GOP debate." The other candidates included Kristin Wiig as Michelle Bachmann, Jason Sudeikis as Mitt Romney and Kenan Thompson as Herman Cain. Steve Martin, who formerly tied for the record with Baldwin, made sure his friend's accomplishment was legitimate by conducting a drug test, overseen by alleged expert Seth Rogen, to make sure Baldwin wasn't hosting on steroids. Baldwin also responded to protests of the new Ben & Jerry's flavor, Schweddy Balls, named after a late `90s sketch featuring Baldwin. 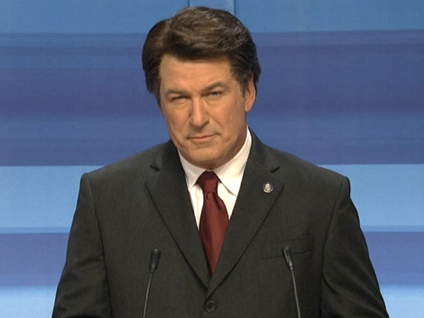 In his monologue, Baldwin said there was a new flavor being released for the flavor's critics: "Go Fudge Yourself." A group of mothers, One Million Moms, has threatened to boycott the ice cream maker. The actor didn't use the opportunity to criticize Fox, which pulled a joke of his at last Sunday's Emmy Awards. His taped segment made light of the hacking scandal in Britain involving the new-defunct News of the World tabloid. Both Fox, which broadcast the awards, and News of the World are owned by News Corp.
Baldwin also performed as Tony Bennett and Al Pacino, as if he were auditioning for "Top Gun."